The Consortium for International Fosterage and Environmental Research and Projects in Osaka Bay (CIFER OSAKA BAY) aims to conserve and restore the environment of coastal areas, as well as to promote the creation and activation of marine industries. Environmental conservation and restoration such as this is expected to form a healthy exchange of nutrients and substances between land and coastal areas of Osaka Bay. Toward the final goal of rich and beautiful Osaka Bay, CIFER Osaka Bay plays its part as a platform for promotion of projects by enhancing cooperation and collaboration among enterprises, administrative agencies, researchers and citizens. As a consequence of the rapid economic growth experienced in Japan following the late 1950s, intensive land reclamation was done along the coast of Osaka Bay to change seaside areas into industrial zones and harbor districts. This caused a large-scale elimination of beautiful sand beaches and nutritious intertidal flats in the bay, resulting in very few remaining natural habitats compared to Tokyo Bay and Ise Bay. In addition, most of the coastal areas were transformed into vertical walls, which sometimes leads to a deteriorated environment for marine organisms. There are many huge hollow areas caused by dredging operations in Osaka Bay, especially along the coast of Senshu. The total volume of the dredged seabed areas reaches 3.2 × 107m3, nearly 27 times the volume of Tokyo dome. Hypoxic and stagnating seawater in the hollows produces poisonous hydrogen sulfide, killing many kinds of marine organisms in and near the hollows. The issue of the large hollow areas in the Osaka Bay seabed should be solved as quickly as possible, but restoration of the hollow is belabored by the tremendous volumes involved. The natural current flow was constricted by land reclamation in the inner areas of Osaka Bay, where abundant nutrient-rich fresh water flows through the Yodo and Yamato rivers. This has led to a sharp increase of nutrient concentration of seawaters in the inner area, while in the central and southern areas of the bay, concentrations of nitrogen and phosphorus declined to an almost oligotrophic level. The imbalanced distribution of nutrients between the inner and southern areas of the bay is severe. Since most of the marine plants and animals require a moderate nutrient level, resolving the maldistribution of nutrients should be addressed as quickly as possible. The participation of many different organizations is needed to solve the issues of the coastal environment, and to promote restoration projects. 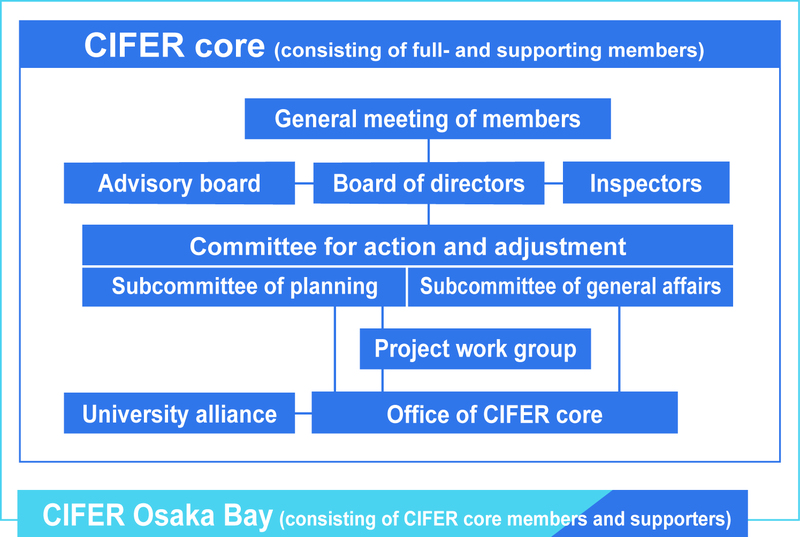 CIFER Osaka Bay believes that constructing a framework is crucial to achieve the cooperation and collaboration of diverse organizations, where each enterprise, administrative agency, institute and citizens can show merit through the process of research, verification tests and practical use. 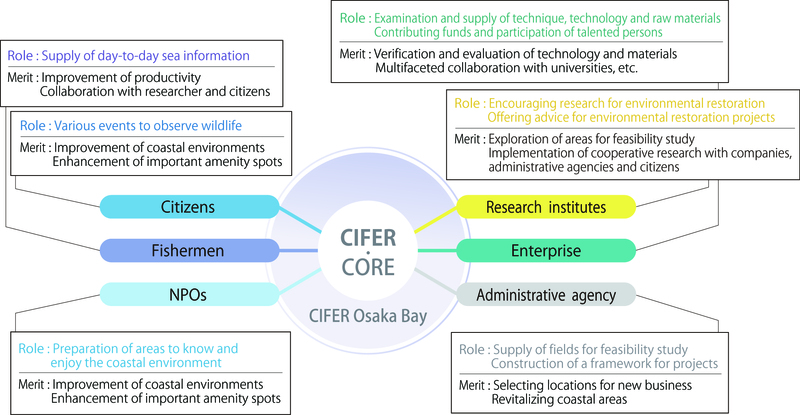 CIFER core sets four major subjects and is expanding the following projects to solve the coastal environmental issues of Osaka Bay. Sakai city local government has announced a vision for restoration and improvement of the seaside zone of Sakai city. Consequently, environment-friendly shores and artificial sandy beaches are now being built along the coast of the city. The Ministry of Land, Infrastructure, Transport and Tourism have experimentally constructed an underwater wall, which is expected to see future use as part of a shallow area. Intensive studies are being carried out to develop methods for coastal environment restoration, including environment-friendly shores and artificial beaches. Field experiments have been carried out on the effect of dredged soil with converter slag at a corner of the 5000m2 artificial beach of Sakai second district opened in spring of 2013 (Sakaihama nature-restoration and community beach). The effects of steel slag on marine organisms, alongside the transformation of sandy beach, are being monitored and examined by a professional committee established by CIFER Osaka Bay. Five different materials for filtration, some of which were developed by corporate members of CIFER, have been put to use, and their effects on water purification examined from 2013. In 2015, experimental tide pools poured with filtered seawaters were constructed and their contributions to clear and biologically rich waterside were investigated. We are planning new experiments in 2017 on the utilization and application of by-products generated from the construction activities. With an area of around 80 hectare and a 2m depth, Kishiwada lumberyard is a precious shallow area at the central coast of Osaka Bay. CIFER Osaka Bay is examining the preservation of liveliness and richness of the shallow area, which is useful for the activation of the local district. As a first step, we have begun experiments to improve the quality of waters and sediments using “ashcrete,” a mixture of water, cement and coal ash. The Eco-block is expected to be an environmentally sound improvement to the environment of the vertical walls, and to serve as a habitat for marine organisms. 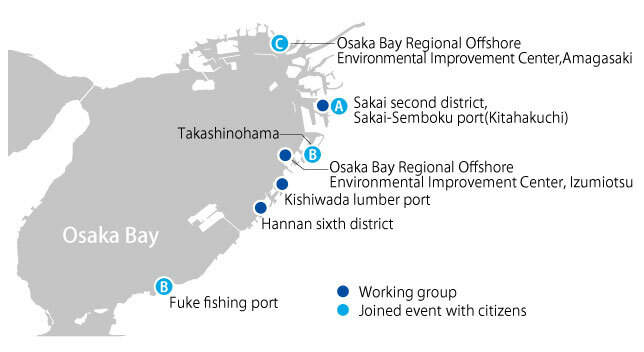 CIFER Osaka Bay is monitoring the environment and organisms of the Eco-block, and examining ways to increase cost efficiency, applicable to various conditions. Small benthic animals and seaweeds survive well on coarse-surfaced walls. CIFER Osaka Bay is examining new eco-friendly walls, where rough panels are attached to existing vertical shore protection walls. This is expected to function as a valuable refugee space for crabs, shrimps and other animals in areas where hypoxic waters occur. Oysters and short-neck clams feed on phytoplankters, and are thought to purify seawaters by filtering as they grow. Through cultivation experiments on the bivalves in the vicinity of a port area, CIFER Osaka Bay is investigating the effects of nutrient uptake and the outbreak of shellfish poisoning. Many oysters can grow faster at Hannan sixth district than other areas due to suitable concentrations of nutrients. We are examining measures to utilize and apply several kinds of by-products (scrap concrete, coal ash, steel slag, and smashed rock) generated in large quantities from construction activities. These by-products have possibilities as a material to restore the coastal environment of Osaka Bay where natural habitats have almost disappeared and large hollows of the seabed are sometimes causing hypoxic waters. We are tackling the fosterage of environmental-protection experts through events aiming to know and enjoy the coastal zone. The Ports and Harbors Bureau of Osaka Prefectural government is promoting the program “Adopt Seaside,” a civic activity for keeping the port and beach clean. In 2013, CIFER core’s Sakai beach cleanup campaign was certified as an official adopt seaside program. Members of CIFER Osaka Bay, in cooperation with NPOs, are joining beach cleanup campaigns, field observations of benthic animals, and work to rouse interest in coastal environments. Sandy beach is a great spot for children to explore bare-footed, finding crabs and sea shells. Since 2014, CIFER Osaka Bay has been conducting a project to construct artificial miniature beaches. Sand was bought by means of supporter membership fees, and was scattered by supporters, volunteers and local elementary school students. Young flatfish have also been released along the beaches by preschool and elementary school children. Local junior- and high-school students cultivate and collect seaweed (wakame) and blue mussels from the sea to learn about the cycle of nutrients between land and sea. They use these seaweeds and mussels as fertilizer on land, growing canola and extracting oil from the seeds. Engineering Co., Ltd, SEKISUI AQUA SYSTEMS CO.,LTD, MIZUKEN Co., Ltd. Copyright © CIFER, All Rights Reserved.